Check cylinder engraving quality including the accuracy of text, colors and ink standards. Production press simulation for samples with different colors offers variety for customers. Reduces ink and material use. Use production inks and materials. In combination with inductive proximity switch and mechanical headstock can make sure the printing roller will return to exact position before every proofing. With a high solution camera and an electronically generated dual cross on the screen which 16 times magnifies the arrow on every cylinder can eliminate parallax error. Consists of 2 doctor blade to intense the hardness. Adjustable angles and pressure accommodates variable patterns of the cylinder. Allows easy and safe loading of a cylinder and wash-off by one operator. It can be suttle adjusted to accommodate different width of the cylinder. Easy and safe operation for loading the cylinder by pneumatically adjusting the deck upward and downward. (1)Smooth, rustproof, and heavy-duty printing roller through chromium-electroplated and grinding process. (2)Bouncy compressible blanket, closely dovetailed with printing roller, can easily be replaced when it is blot and spoiled. (3)The proofing length is up to 2500mm. Depending on the size of cylinders, it can print at least 2 copies of samples in every proofing. 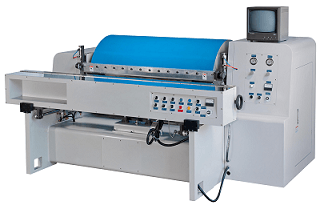 The printing roller is driven by an powerful 7.5 HP vector motor. Accommodating different material and ink quality, the proofing speed can be adjusted from 20 to 90 m/min. All of the sliders applied to air chuck and cylinder adopt linear guide ways. With height position exactitude, the device will not facilely glide on linear movement.